We recently had the opportunity to stay a few nights at the amazing Pongara Ecolodge (www.pongara-lodge.com) on Le Pointe, an island 30 minutes from Libreville, the capital city of Gabon. We were drawn to these masks, which have been cleverly transformed into stylish lamps that can withstand the elements on this outdoor terrace. Realizing that African ‘art’ stems from cultural ceremonies and traditions, these masks and sculptures should not be seen by way of the western concept of art for arts sake, but the African one of rites, spiritual world and ancestors’ worship. With this perspective in mind we note that this is an original mask of the Ogooue, of the Kota and Mukudji tribes. Known as punu in Gabonese, they are carved from hardwood and decorated with white and red kaolin- based pigments. The temporal scarifications in the form of nine small diamonds together forming one large diamond evoke the notion of perfection and wisdom for this tribe. The mask itself represents their ideal of female beauty as well as the wisdom and serenity of the Ancients who protect the tribe from the kingdom of the dead. These masks are often referred to as ‘spirit guides’. While in Libreville, we were thrilled to be invited to visit a private collection of traditional African art. 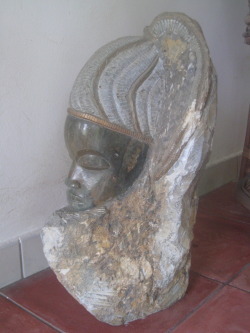 This sculpture of a female head we found to be entrancing. 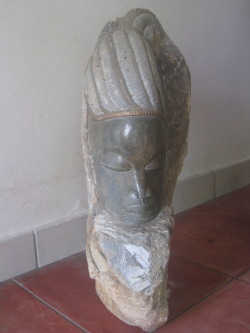 She merges from Mbigou stone, which is a type of soapstone mined in a town by the same name a few hundred kilometers from Libreville. It’s malleability initially made it well known in certain circles of sculptors. It has a gray tone with hints of green and garnet that give an ethereal glow to the polished surface. Some say that this stone is used to peddle the spirits of the Ancients. Also in this fabulous private collection in Libreville we admired these stylized figures, which to our Western eyes were immediately reminiscent of Alberto Giacometti’s (Swiss sculptor b.1901 - d.1966) surrealist figures through the similar usage of elongated form. However, this male and female pair comes from the Ivory Coast. Unlike Giacometti’s sculptures, these smooth wooden figures are represented by protruding bellies, pensive stances and birds poised atop their heads. An exhibition entitled Giacometti and the Etruscans just closed in January at the Pinacotheque de Paris. The catalogue is still available at the museum (www.pinacotheque.com/?id=707) and in it are discussed Giacometti’s long fascination with the ’primitive arts’ of the Aztecs, Maya and African civilizations. Ultimately it was Etruscan (modern-day Tuscany in central Italy) sculpture, that informed his elongated figures.